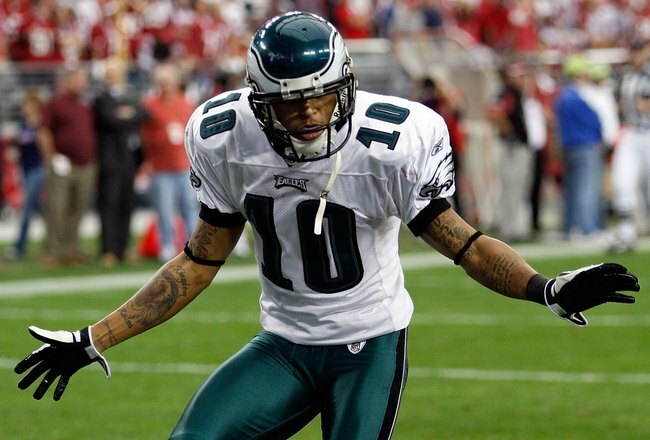 Like many athletes in this generation, Philadelphia Eagles wide receiver DeSean Jackson is a frequent user of Facebook and Twitter; the main difference between him and other athletes is he’s using these social media sites for more than just entertainment purposes. The Pro Bowl wide receiver is using these social media sites to interact with fans about The DeSean Jackson Foundation For Pancreatic Cancer on his new site http://deseanjacksonsfoundation.org —a site created in honor of his father who passed away from the disease in 2009. Jackson is urging fans to simply take a few minutes of their time to spread awareness about a disease that has not only affected his life, but the lives of millions of others. Pancreatic cancer is a malignant tumor of the pancreas and is the fourth leading cause of death in men and women. Every hour, four people die from the horrendous disease, which is almost equivalent to 100 people each day. Not only does this have an effect on the individual, but the families and friends surrounding them as well. DeSean’s father, Bill, was officially diagnosed with pancreatic cancer during the Eagles’ playoff game against the New York Giants in 2009. Ever since they were young, Bill’s dream for his two sons—DeSean and Byron—was to play football at a professional level. Bill knew his sons were blessed with the type of talent that would take them to a professional level. He wasn’t afraid to push his sons the extra mile with the dream of his boys playing in the NFL one day. Eventually, his dreams came true. While Byron managed to play two seasons on the practice squad for the Kansas City Chiefs before taking on a career in film, Bill was fortunate enough to watch DeSean breakout as one of the top wide receivers for the Eagles during his rookie campaign. One of his favorite memories was the miraculous 62-yard touchdown reception in the NFC Championship game against the Arizona Cardinals that gave the Eagles their first lead of the game after trailing 18 points at halftime. Philadelphia may have lost the game, but it held a special place in Bill’s heart to watch his son perform at that level at such an early point in his career. The fact that DeSean caused nothing but headaches for opposing defenders and played such a key role in the Eagles’ passing game was nothing short of a dream come true for a father who wanted his son to succeed in the NFL more than anything in the world. Byron said it best during one of the trailers for his upcoming documentary—The William Jackson Project —when he described his father’s joy at watching his son shine in the NFC Championship game as greater than witnessing him win the Super Bowl. Watching DeSean succeed after a career full of critics telling him he would never make it as an effective wide receiver was one of the happiest moments of Bill’s life. Even NFL analysts suggested teams should stick away from drafting him in 2008. Obviously, all those analysts were wrong. Shortly after Bill passed away in May 2009, DeSean’s mother, Gayle, suggested her son take advantage of his celebrity status by establishing a foundation in his father’s memory. With a strong supporting cast, Jackson and his family are determined to do everything they can to help find a cure for a disease that has killed 39,000 of the 47,000 people diagnosed with it in 2009–especially when it comes to using social media sites. Jackson realizes the potential of using social media sites like Facebook and Twitter to spread the word about pancreatic cancer to his fans. One of the best features about Foundation10.com is the interaction with fans. Jackson knows he’s not the only one affected by this disease, which is why he’s dedicated a section to allow fans the opportunity to share their stories regarding loved ones and pancreatic cancer. The sites have not only played a major role in spreading the word about the new fundraising site, but the disease in general. Jackson hopes the fans can take part in their 10-10-10 campaign by spreading the word about pancreatic cancer with the hope of helping others catch the disease early enough before it’s too late. Fans can learn more about pancreatic cancer and The DeSean Jackson Foundation t http://deseanjacksonsfoundation.org. WHAT: More than 250 people are expected to attend Penn Medicine’s 4th annual “Focus on Gastrointestinal Cancers” conference. The event is offered to those at risk or in treatment for colon, liver or pancreatic cancer, as well as survivors, family members, caregivers and health care professionals. Gayle Jackson, mother of Philadelphia Eagles’ wide receiver DeSean Jackson – whose father died of pancreatic cancer in 2009 – will give an inspirational keynote address titled “A Caregiver’s Story.” The conference, sponsored by the Abramson Cancer Center, is free of charge. WHEN: Friday, March 26, 2010 7:45 a.m. to 2:45 p.m.NOTE: Gayle Jackson will speak from 9 to 9:10 a.m., followed by a five-minute question-and-answer session. Bill Jackson fought a courageous battle against pancreatic cancer, but he lost the fight on May 14, 2009. The DeSean Jackson Foundation for Pancreatic Cancer was established to honor his legacy and to bring awareness to this disease. At the conference,Gayle Jackson, Bill’s wife, will discuss her personal experience as a caregiver and how the Foundation aims to improve the quality of life for patients and their families. It is the mission of the DeSean Jackson Foundation for Pancreatic Cancer to provide hope and to support new and innovative initiatives aimed at finding a cure for pancreatic cancer today.